If you’ve been reading my blog over the last year you probably know that I’ve spent quite a bit of time writing and thinking about social content readers. Actually, I’m pretty obsessed with them. I’ve been thinking about this for a long time and last year finally posted my thoughts on the features and functionality I’d like to see built into a social content reader. Well a few months after that post Flipboard was released for the iPad and with its success they have now paved the way for many new entrants. Curation is still one of the top buzzwords in tech. By connecting our Twitter, Facebook, and other accounts, These social content readers give us the ability to have our social graph curate the news for us. The problem for now is that most of these either only show us the most recent content shared by our friends at the time we decide to fire them up, or use a relevance algorithm that we can’t tweak. I feel we really need to see some more advanced filtering and prioritizing features built into them. I’m currently seeing a few glimpses of these features but they are dispersed among many different readers. Newly launched BroadFeed provides logic that is similar to Tweeted Times by ranking the news based on the number of people sharing it on Twitter. Newsmix puts photos and videos into their own segregated buckets where you can isolate viewing that content type in its own section. Lastly Zite and My6Sense use proprietary algorithms to determine how to deliver the most relevant content to their users. Most of these social content readers are materializing as apps for iOS to follow in Flipboard’s footsteps but they are also hitting Android, the web, and appearing as extensions for browsers. These readers are proliferating for several reasons. I primarily find the rise of these as a way of helping fight the battle of ongoing noise in the firehose. Other reasons are that they provide a very clean and beautiful reading experience on the booming iPad / tablet space. Then the ability to share the content on social networks, bookmark the content, and save them to external services like Instapaper add another level of sophistication. Since these apps and web services have so many varying goals it’s going to be difficult to find one that will capture all the specific features every user wants. Many also see this category of apps as a way to democratize news by not limiting big media’s control of it. 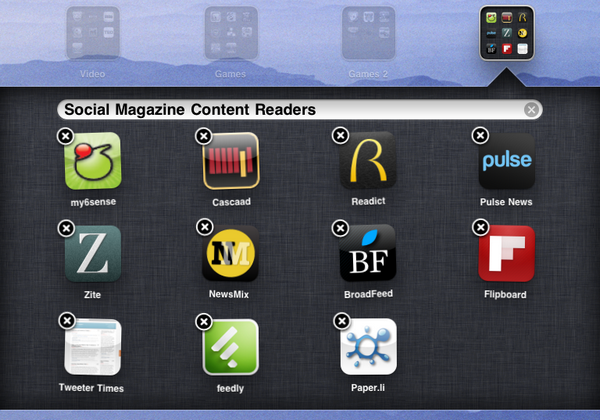 In any case Flipboard, nor the slew of other apps and services have yet to provide all the features I’m looking for. Still, their popularity have almost cemented this category to skyrocket over the next year or longer. Below is a comparison chart I’ve created to identify some of players in this space. You can bookmark this post as a reference as I plan add more apps and services as well as update this embedded Google Doc as I continue to follow these closely. If you have any tips on modifying this or know of any services to add, or find mistakes, let me know in the comments. Hey Mark! Thanks for mentioning Summify! I’ve read you other post about features and functionality and it’s really insightful. Nice post mark , thanks for sharing the information. to maintain a record high since the release.